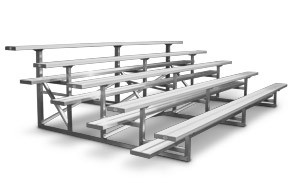 Quality Bleachers Series offer a stationary, economical bleacher seating option perfect for large or small crowds. This bleacher series features double footboards on rows 4 and up for extra footing safety and comfort at higher levels. Chainlink, Aluminum Picket or Galvanized Picket Guardrails available on 4 row units and up for maximum safety and ADA compliance. Tip and Roll kit, available on 3, 4, and 5 row units, allows to easily tip the bleachers into the upright position, and using the 5" non-marring swivel casters, simply roll the unit to its storage spot. Galvanized Picket Guardrail is available on 10 Row Bleachers for a safe, yet economical option. 2, 3, 4, 5, 8, 10, 15 Row Units. 15', 21' & 27" Lengths. Single Footboards on Rows 2 and 3. Chainlink, Aluminum Picket or Galvanized Picket Guardrail on 4 Row Units and Higher.